I first remember eating Gozleme in one of the London food markets over 10 years ago and absolutely loved them . 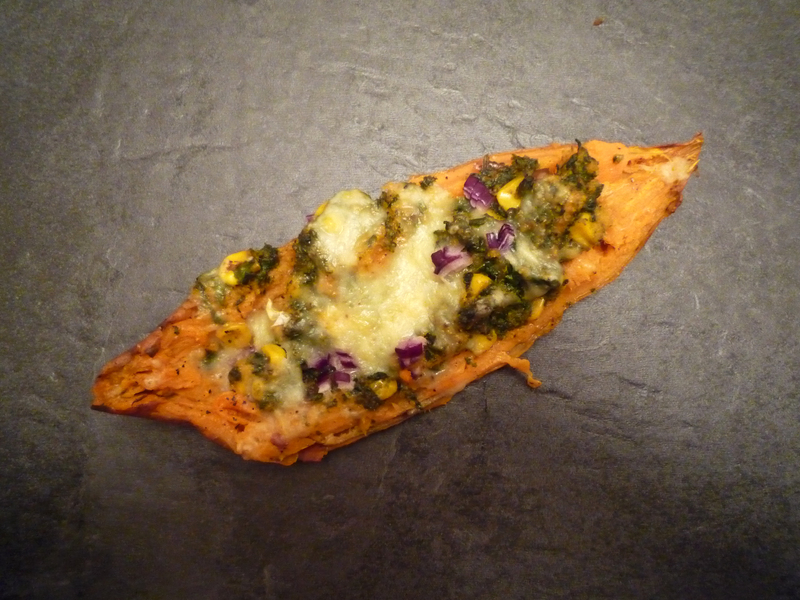 I just loved the thin, chewy but crispy texture of the flat bread with the fresh spinach and salty cheese. Gozleme is coined from the Turkish word ‘goz’ which translates to ‘compartment or eye’ in English is a sweet-smelling, freshly made pastry that is indigenous to Turkey. Gozleme, as it is popularly called is made from a big, circular dough that has been spread thin like a wafer. This snack is so named because it is made of pockets of dough where toppings are placed and sealed before they are cooked. I found this amazing recipe it is so easy to follow and make. These turned out to be so delicious and I will definately be making them again. This would work well as part of mezze board. I made these a medium sized, but they can be made any size you want. They are so versatile any filling can be added. 1. Place the sugar, yeast and water in a large bowl and mix well. Keep aside in a warm place for 10 minutes. 2. Add the remaining ingredients (flour, plain yogurt and salt to the bowl. Mix well to form a dough. 3. Transfer the dough to a lightly floured surface and knead for 5 minutes or until smooth. 4. Put the dough back to the bowl, brush with olive oil, cover with a clean towel and allow to rise for 30 minutes or until doubled in size in a warm place. 5. Divide the dough into 10 equal pieces, form balls and roll out each ball on a lightly floured surface into a 23 cm/9 inch circle ( 2 mm thick). 6. On one side of each circle add one-two tablespoons of the mixture. 7. Fold the other half of the dough over and seal the edges. 8. Lightly grease a pan with oil and heat it over high heat. Brush each gozleme with oil and cook for 2 minutes per each side or until golden. Repeat with the remaining gozleme. 1. In a frying pan add some olive oil and then the onions, let it soften, then add the garlic let it cook for a minute. Add the salt, pepper and chilli flakes then add the spinach. Place a lid over and let it cook until all the spinach has wilted down. 2. Once cooked, leave to cool and add the feta cheese. *You may not need all the water as different types of flour absorb at different rates. I recommend to add water gradually. Whilst I was grating the courgettes for the courgette scones I was making. I overgrated and I decided the left over courgettes would be great for making into a frittata or was it a tortilla? I had to check what the difference is between them…thanks to google…this is the difference. So in the end I made a frittata, I didn’t realise that was the only difference between them is that it?! This frittata was so simple and easy to make and would make a easy dinner if your busy. It does take a long time to cook, but prep work is simple and you can leave it in the oven whilst you get on with other things. You can also experiment with flavours and ingredients as long as you have enough eggs. I think this is a good way of getting rid of vegetables that are stuck in the back of the fridge. To make it more luxurious is to add some good cheeses. 2. In a mixing bowl, crack all 4 eggs and whisk. Add the seasoning then add half the grated courgettes and mix until combined. 3. Pour the egg mixture into a well greased cast iron or dish that can be put in the oven. (If you don't have a ovenproof pan). 4. Place the rest of the grated courgettes and randomly scatter the teared mozzarella. 5. Leave to cook for 35-40 mins. At home I had come across not only 1 but 2 packets of risotto!!! oooo dear don’t worry they were still well in date but I wanted to be use them up! I do find risotto one of them things which can be quite blad unless it’s really flavoured but but but these aracini balls are something you know which would give that extra flavour o yeah! I also wanted to use mushrooms so they risotto would absorb all that yummy mushroom juices. Did you actually know that arancini actually translates to ‘little oranges’ in Italian, see you learn something new everyday (unless of course you speak Italian). Traditionally the arancini are fried but I didn’t want to fry them I wanted a healthier option so baked them. This recipe is a bit long winded I think I tend to come across all these long winded dishes but they do tend to be worth it in the end!. I did make the risotto the day before not to save time but when you make the balls the rice needs to be cold to allow it to form, this is important so allow time for that. I think you could make the risotto a few hours ahead and it hopefully would be chilled enough. In addition to the risotto balls I did make a spicy mariana sauce, (you can always use shop brought) which is the basic recipe I usually use, it can be found on this post. This can also be made the day before or whilst the risotto balls are cooking in the oven, I would recommend making it the day before so the flavours soak up. I know most risotto uses stock but I used hot water as I find stock too salty and over powered, that’s why I add extra flavour to compensate, however you can go ahead and use as much stock as you want to! 2 - red chillies finely chopped and extra 1/2 chilli powder if you like it hot! 1. In a large saucepan with a lid add the olive oil and leave to get hot, once it's reached a high temperature add the risotto rice and leave to cook for 5 mins on a medium heat. Add the onions and let it cook for another 10 mins until the onions are slightly soft. 2. Add all the seasoning salt, pepper, oregano, basil(or any other herbs), chillies and chilli powder. Start adding the hot water and the add the glass of wine, after 10 mins of cooking add the chopped mushrooms and keep adding the water in stages and stirring. In the last 10 minutes add the minced garlic. 3. Let it cook for 35-40 minutes, making sure all the water has been absorbed I do like my rice cooked not al dente so if you want it that texture cook it for 20-25 minutes. Garnish the risotto with fresh parsley if using. 4. Let the rice completely cool and place in the fridge overnight if possible. 1. Preheat the oven at 190°C and line a baking sheet with grease proof paper. 2. Have three bowls ready - 1 for the beaten egg, 1 with the breadcrumbs and the last one with mozzarella in. 3. Take a golf sized amount of rice and flatten it out on your hand then add the mozzarella piece sprinkling of cheddar cheese and 1 tsp of the sauce, cover the rice around it and form it into a ball. Place the ball into the egg, then into the breadcrumnbs and then place on the tray. 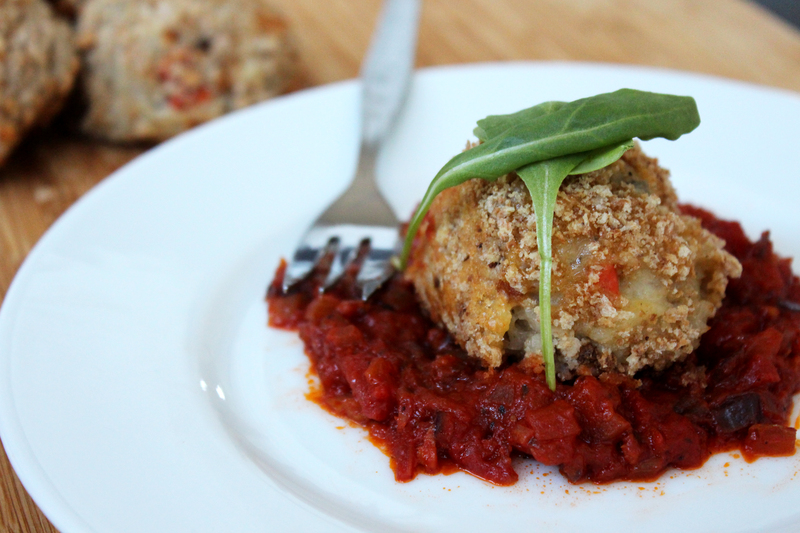 When I made this the risotto balls were a bit too big I would suggest to make them the size of a golf ball. Trout reminds me of streams and old men fishing for ages along the bank, I don’t actually think like that when I’m eating it though!. I do think trout is under rated and should be eaten a lot more as it’s so yummmmmy! As it’s such a light, flakey fish and I wanted to try out to keep it that way. I decided to make a butter to place over it. 1. In a small bowl add the softened butter, garlic, parsley, salt, pepper and chilli flakes, when throughly mixed place the butter on a piece of cling fling and form it into a round log shape, make sure it's well wrapped and chill for at least 30 mins. 2. Once the butter is solidified then your ready to cook your fish, firstly cut the pieces of butter into thick slices so it's ready once the fish has been cooked. 3. In a large plate add a generous amount of flour and salt & pepper and coat the fish with the flour, then make slight incisions on the skin. 4. In a large frying pan heat oil I choose olive but any will do, add the floured fish skin down and cook for 3-4 min each side. 5. Place on a plate then add the slices of butter let it melt through and enjoy. You can use whatever herbs you like rosemary, basil, coriander but it's best to use fresh. When I first seen this recipe I didn’t even know that something like this exists! as I like a bit of aubergine I had to make it and it did made me think hmmmmm what else can I make into meatfree balls? hmmmmmm! This is a really interesting and flavourful dish but something that needs a bit of time to make. 1. In a saucepan add the olive oil and let it heat then add the chopped onions, garlic and aubergine and salt and pepper let it cook until it's soft then leave it to cool. 2. In a food processor pulse the mixture until it's a puree. 3. In a big enough bowl to add the mixture back in add the breadcrumbs, flax egg, parsley all the seasoning and then the cooled aubergine mixture, mix together until combined. 4. Shape the mixture into smalls balls I can't remember how many I made but according to the original recipe there was 9 place them on a baking tray with greased proof paper. Add a drizzle of oil over them. 5. Bake for 40+ mins on 190°C, they will be brown on the outside but the centre will be soft. I also added chilli flakes to give it a bit of kick. You may find the mixture a bit too soft if so add a bit more breadcrumbs to bind it. I made some tomato tagliatelle to serve it with. This recipe did take a while to make but it was worth it. I really like spinach and ricotta cannelloni which I’ve made a few times but I wanted to try something a bit different so I thought of using aubergine with the spinach and ricotta mix and then baking it. This recipe does take a while to make and involves a few processes but it’s worth the wait yummmmmmy. 1. Start by making the sauce. Add a good gulg of olive oil to a saucepan and let it heat up add the onion and garlic fry until soft then add the chopped tomatoes, salt and pepper to taste, herbs and leave to simmer. 2. In another saucepan heat the olive oil and add the minced garlic, let it fry until soft then add the fresh/frozen spinach and add the nutmeg, salt and pepper leave to cook. 3. Add some flour in plate. Thinly slice the aubergine and coat the aubergine in the flour. In a large frying pan heat up some olive oil and add the coated aubergine fry until slightly cooked. Repeat until all the aubergines are cooked. 4. Check on the spinach and make sure any water is burnt off, switch it off and leave to cool then mix in the tub of ricotta cheese. 7. Take a piece of the aubergine and from one end add a heaping of the spinach mix and roll the aubergine up. Stack the aubergine upright and continue until it’s all finished. 8. 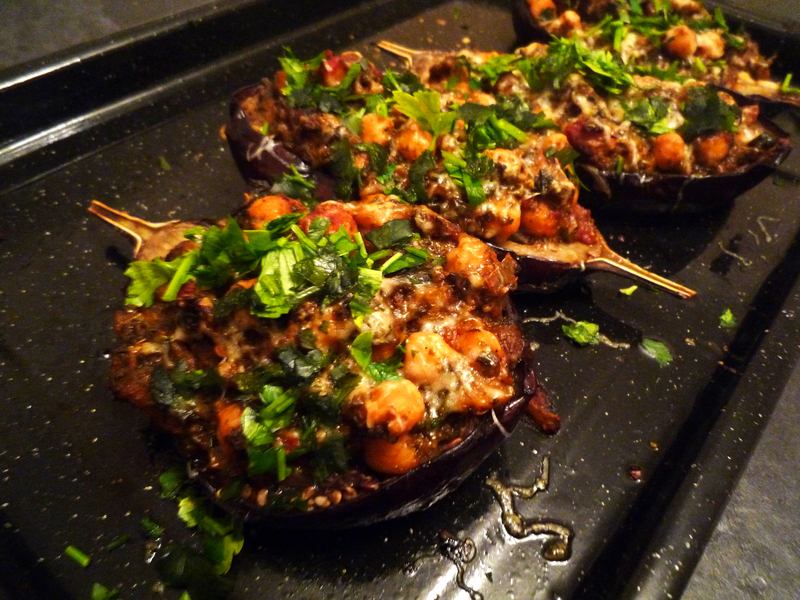 Pour the sauce all over the aubergine and bake for 25-30 mins until it’s golden at the top. I needed to add more cheese my dish looked very tomatoey, next time I make the dish I would add grated cheddar cheese as well as Mozzarella. 1. Preheat the oven to 200°C, make sure the fish is clean and gutted, place the fish on a large piece of greased foil with a baking tray underneath. 2. Place the cut the lemon and crushed garlic inside the fish and also season with salt and pepper. 3. *If you haven’t got any breadcrumbs then you can use any white bread (stale works better). Place all the rest of the ingredients in the food processor and grind until they are in tiny pieces. Place all the mixture on top of the fish. 4. Wrap the fish up and bake for 15-25 mins depending on how big the fish is. 5. Open up and eat from the foil for extra yummyness. Cobble eh?…reminds me of a shoemaker ;) but no no no it’s also to do with food :). 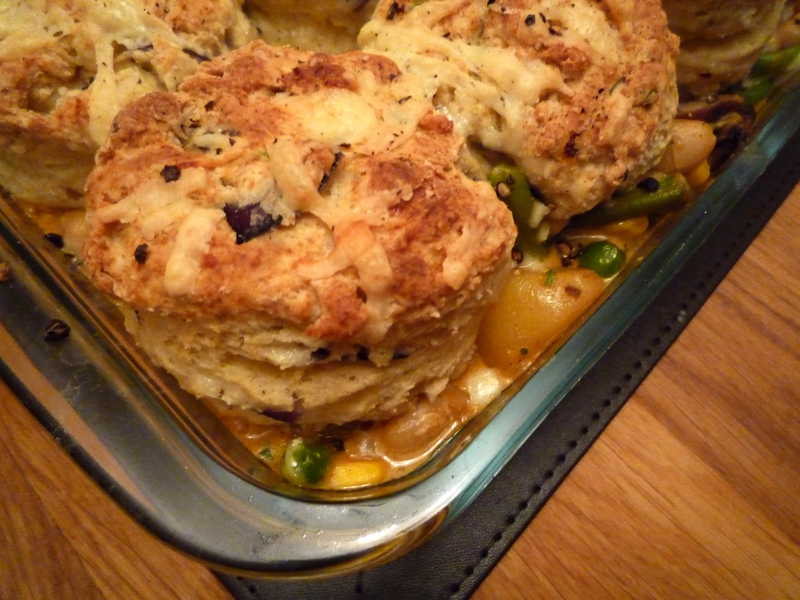 Cobblers can be made savoury or sweet, (it’s mainly a dish with a topping on top either a biscuit style, batter or pie crust) I have made a sweet cobbler before but this was the first time I made a savoury one, the savoury one is mainly like scones on top of a mixture of filling. This is a nice dish to make when it’s cold outside it’s quite a comforting dish. I made this recipe using me own ideas and used whatever vegetables were available and I thought I would use a skinny white sauce style practically milk mainly. Please refer to my scone recipe (link below) but replace the sugar with the same amount of grated cheese and add some chives and red onions and 1/4 tsp of salt and good amount of freshly ground pepper. 1. Add some oil(olive or vegetable) into a saucepan let it heat then add the garlic and onions then add the flour stir it through and let it cook and then add the milk and add all the vegetables apart from the beans and all the seasoning (pepper, salt, nutmeg & bay leaves) cover with a lid and let it cook. 2. Preheat the oven to 190°C. 3. Meanwhile start making the scones using the scone recipe in the link above. 4. Check on the filling when the potatoes are nearly cooked add the beans and check on the taste change accordingly leave the pan uncovered to reduce the sauce, let it cook until the potatoes are just cooked, add the freshly cut parsley and stir through. 5. Finish off making the scones and cut the scones according to the size of the dish (these were a smaller size then the ones I made before) add some grated cheese and ground pepper on top of each one. 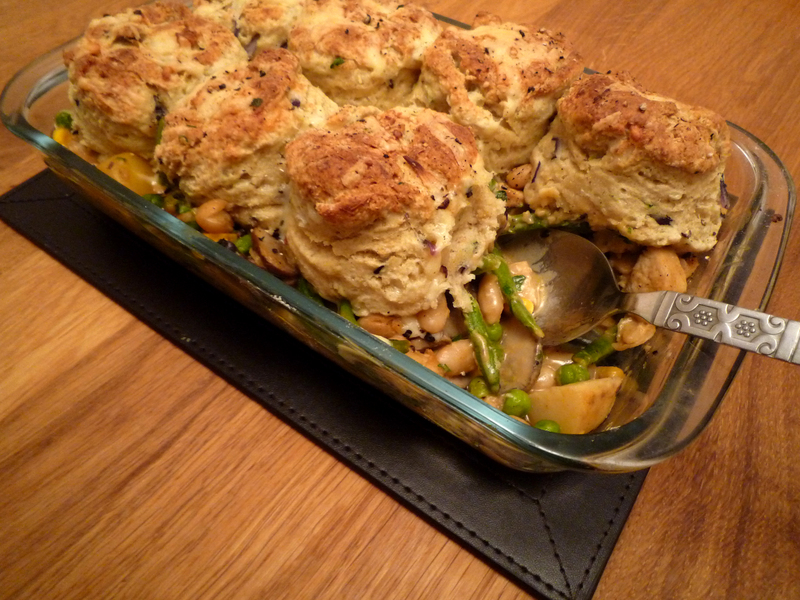 Line the dish with a bit of oil to grease it, add the mixture and then the scones on top. Then bake for 15-20 mins, check the scones are slightly coloured on top. Try and use a deep dish. As this was the first time I made this dish next time I would make it more saucy, I found there wasn’t enough sauce but also use a deep so it will allow for the sauce. 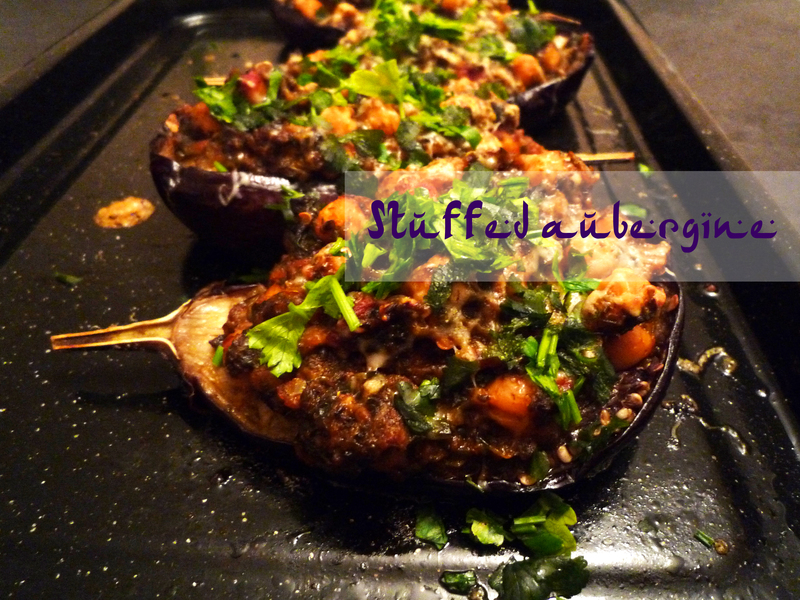 After making the stuffed sweet potatoes, an idea came to me about stuffing aubergines, we make aubergine quite a lot and I really like them! I was thinking of doing something different and inspired by middle east theme, using harrissa paste and I thought of using chickpeas and spinach. I know chickpeas are used a lot in the middle east. This is great accompanied with cous cous and fresh salad it makes a lovely wholesome vegetarian dish yum yum enjoy. 1. Preheat the oven at 175°C, wash the aubergine and cut them in half length ways, oil the tray, place the aubergines on a baking tray and cook, this will take a while 20-30 mins. 3. Check on the aubergines and hopefully they are cooked, it should be soft and you should be able to scoop the filling out, scoop out the mixture and place all the filling in the saucepan with the rest of the chickpeas and spinach. 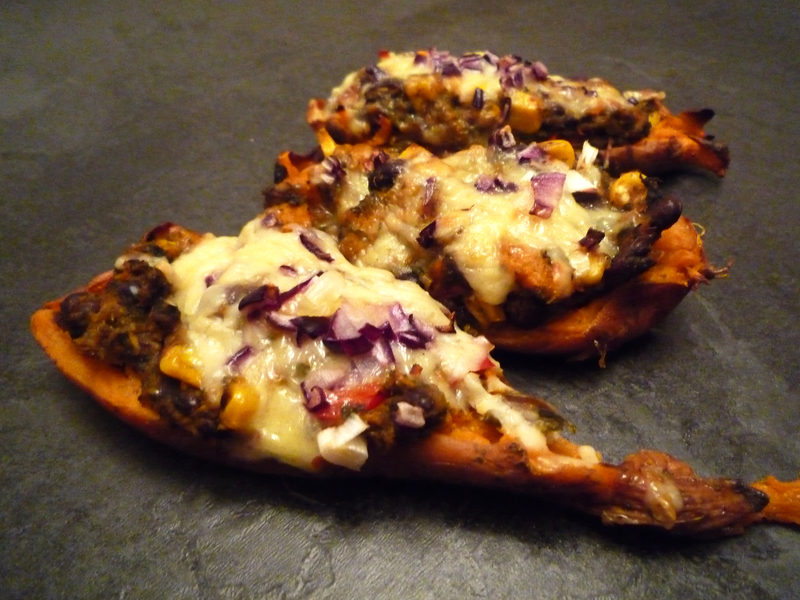 Leave the scooped out aubergines on the baking tray. 4. Let the mixture simmer and when it’s completely cooked make sure you try the mixture to see what is missing and re season if necessary then divide the mixture between the 4 aubergines, add the grated cheese. 5. 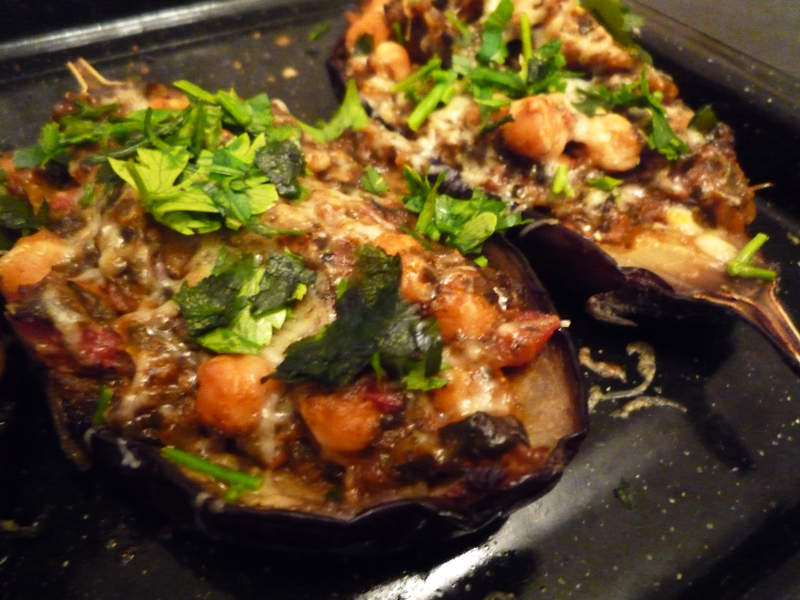 Let the aubergines cook for about 15-20 mins in the oven until it seemed totally cooked, garnish with fresh herbs and enjoy. 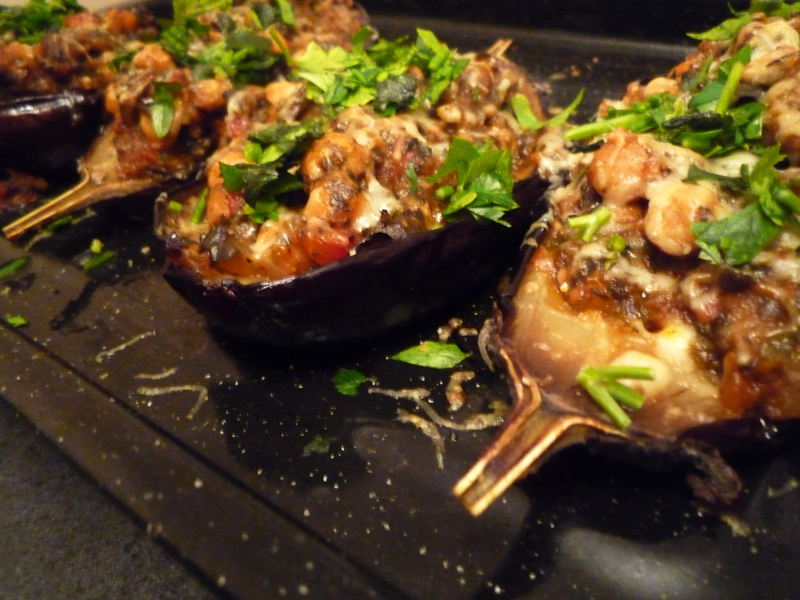 These aubergines are best served with couscous to keep up with the Moroccan theme. Firstly I would like to wish everyone Happy Navratri. (Navarati is the festival usually celebrated in the autumn, the word Navaratri literally means nine nights in Sanskrit. It symbolises the triumph of good over evil. During this festival the goddess Durga is worshiped) it’s also a no meat (which includes no eggs too) & no drink period as it’s an religious event. When I came across this recipe I decided to give it a go now as it doesn’t contain any eggs and is veg. I love the taste of sweet potato, I usually roast mine but have never thought of stuffing them! I loved the flavours in this recipe, it had cumin and chilli, which is always nice but I also added a bit of lemon to give it that extra zing! This particular one is stuffed without any beans as a certain person in my family doesn’t like anything bean related apart from baked beans…weirdo! 1. Preheat oven at 150°C oil a oven tray. 2. Prick the sweet potatoes and microwave for 10-13 mins make sure you cover the potatoes with a microwave cover. 3. Add olive oil into a frying pan wait till it’s hot then crushed garlic cook for a minute then add the sweetcorn and spinach, add the seasoning let it cook and once it’s finished cooking empty the contents in a mixing bowl. 4. Make sure the sweet potatoes are cooked enough to be scooped out and if not cook for longer. 5. Scoop out the potato filling (leaving a bit around the edges to keep the potato stable) using a melon scoop or a spoon if you don’t have one, once finished empty into the mixing bowl with the cooked spinach and sweetcorn. 6. Mix the mixture in the bowl throughly and taste the mixture, add more seasoning if needed. 7. 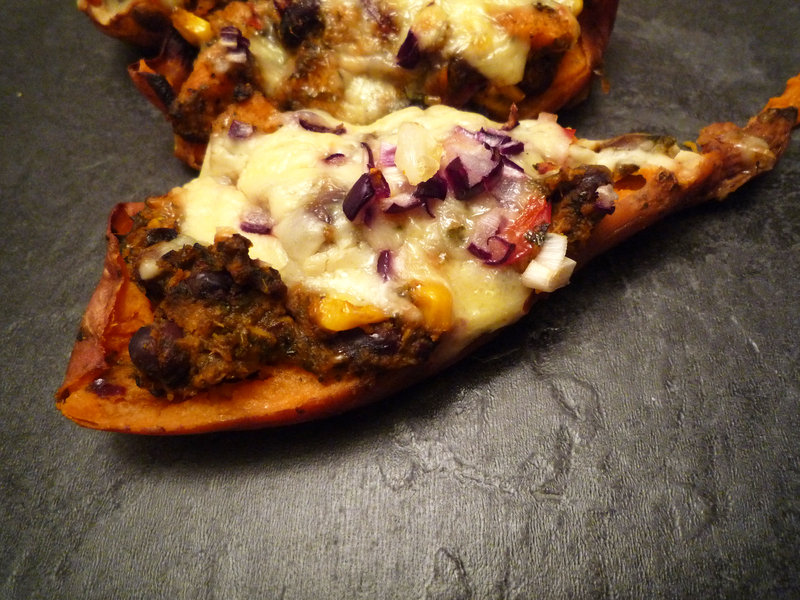 Fill each sweet potato with the mixture and then add the grated cheese then the red onions. 8. If cooking later then cook for 20-25mins on 170°C. * Sorry about not measuring these ingredients I just guessed. 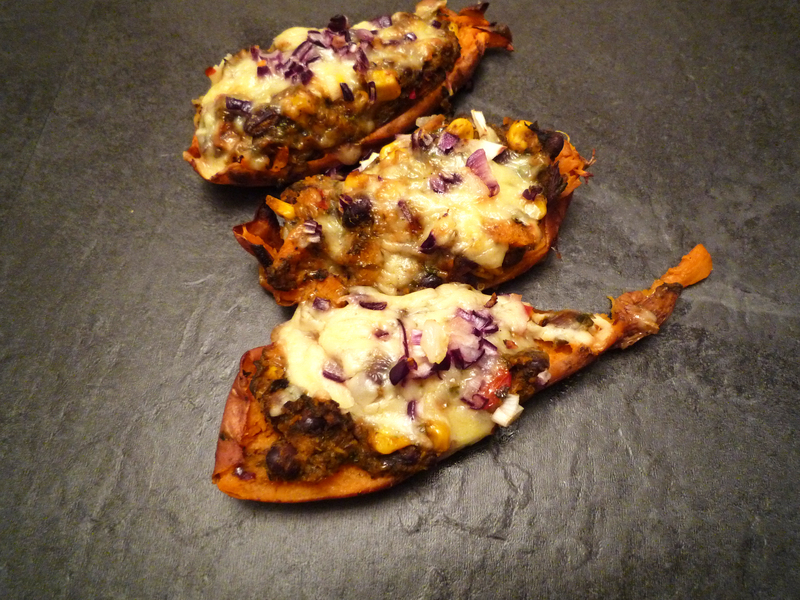 Next time I make this I wouldn't add as much sweetcorn but more spinach as the sweet potatoes are sweet enough. I'd also add some fresh coriander with the garnish. One mistake I made was using small thin potatoes instead of big rounder style one, this would be easier to fill and hold it's shape, just remember this will need longer microwave and cooking time.